Tamil – A Blog on Tamil and other things. Android Jelly Bean support for display of Tamil and Indic languages scores a perfect 100/100. Please let me know if you would like to check anything specifically. The latest Android Ice Cream Sandwich release was keenly awaited by Indic languages as the earlier versions did not provide native support. 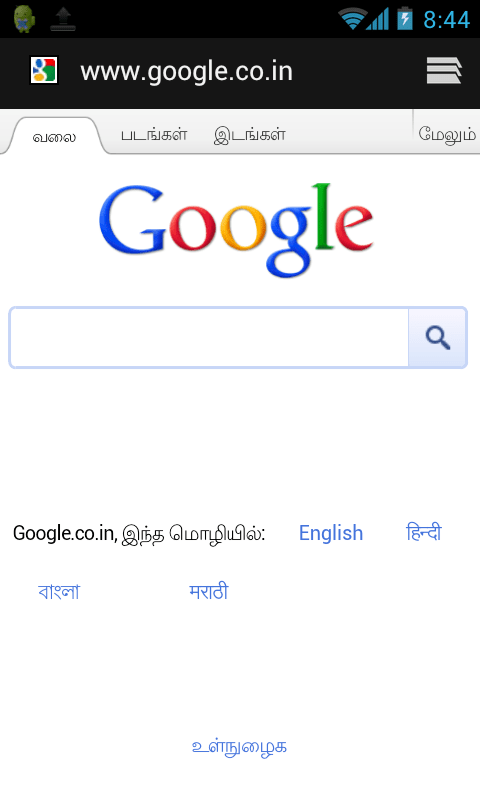 I upgraded the OS in my Google Nexus S and found that Tamil is supported well in some native apps. Earlier we could only rely on some external android apps or hacks to view Tamil. You can view the screenshots below with captions to understand the issues. 1. Tamil is shown well in Android’s native browser and Facebook app. However, the letters are seen scrambled in many other apps like Twitter, Music and SMS. Inference: Android provides native support for Tamil but the apps also have to code well to show it. Is it possible to do a single app that will fix this problem in all other apps present? * Languages by number of speakers (But Telugu has more speakers than Tamil) ? * Possibility of revenue generation in these languages (Ad revenue in all Indic languages are almost nill or equal) ? * Based on the activity online? (I would guess that it is based on the volume of content, search queries, people using Google interfaces in their language). Android ICS Pro Tip: You can take screen shots like this by pressing the volume+power button together. The screen shots will be stored in your gallery. Then, you can share them easily across the web. Android OS for mobile phones is yet to have inbuilt support for Tamil Unicode fonts. * Tamil Visai – To type Tamil in any Android app using transliteration, Tamil99 keyboard. Using this you can publish in Unicode Tamil font in websites. You can also send Tamil SMSes to other phones supporting Tamil display. * SETT browser – To display Tamil Unicode text properly. * Opera Mini browser can display Tamil Websites as bitmap images. Select YES for “Use BitMap fonts for complex scripts” in the settings. But still, there is no inbuilt support yet. So, you cannot see Unicode Tamil text in all applications. You can’t read Tamil SMSes and there is no Tamil interface yet. Since Android is a open source software and Indic market can’t be ignored for long, we can hope to see inbuilt Tamil support soon in Android. If you are power user, you can root your android phone and install Tamil Unicode font provided by Krishnan. If you are an application developer, you can use TSCII fonts to display Tamil letters in your app. 1. Proz.com – This is the number one and one of the oldest websites for freelance translators. 2. Gotranslators.com/ – Reliable source. Thanks: Satan for providing the above info. Do you know websites of any other Tamil newspaper from Tamilnadu, Srilanka and other parts of the world? Please let me know. Besides hosting the printed உயிர்மை magazine, Uyirmmai has a column / blog page by its publisher Manushyaputhiran. The site also offers online shopping to buy Tamil books published by Uyirmai. காலச்சுவடு provides a very valuable archive of all it’s monthly publications. It is one of the very well designed Tamil magazine portals. 4. Noolaham.net – நூலகம் is a non-profit collaborative volunteer initiative from SriLanka to digitize Tamil literary works from Eelam. Besides archiving many old magazines, it presents contemporary magazines like மல்லிகை, ஞானம், பயில் நிலம். 5. Collection of many small Tamil magazines. Keetru is one of the extensive, comprehensive and informative contemporary Tamil literature source online. The magazines hosted are intentionally selected and voice alternative and forward thinking supporting the oppressed people. The following magazines are archived here. * Kudhiraiveeran Payanam ( குதிரைவீரன் பயணம் ). Do you know website of any other Tamil literature magazine? Please let me know in the comments. Is there a (free) English – Tamil translation software for download / online? The answer is YES. Visit Google Translate for translating Tamil to and from many languages. This is an alpha version so you may not get the best result always. There are some long running machine based translation research projects at Universities. But none have given usable product yet. Google is the first to offer translation services for tamil. They also give a translation toolkit that can be used for any language. Wikibhasha is another translation toolkit for Wikipedia developed by Microsoft. Right now thier efficiency for Tamil translation is very rudimentary. It is supposed to get better when more users use it. Google says that it can bring better automatic machine based translation for Tamil too, if it can get millions of pages of documents with English and Tamil translation side by side. One place where such translated documents may reside with the legal department of the country. It’s in the Government’s hands to give them for public research if not to a private company like Google. 1. Free Tamil computing group – Free Tamil computing group is a good place to discuss, announce various topics related to Tamil computing. The group is quite active and has lot of friendly people. 2. INFITT – INFITT is a well known Think-Tank for Tamil computing. The group has lot of veterans and plays a key role world for policy decisions regarding Tamil computing and Tamil Internet. It is a must for any Tamil computing enthusiast to know what’s happening.